In the last ten years I have spoken at AWS, PHP, Linux, Perl, Java, and .NET user groups in the US, Europe, and Asia. User groups are simultaneously less formal and more intense than conference sessions. Instead of the usual 20-30 minutes allotted to a speaker at a conference, a good session at a user group can sometimes last 60 to 90 minutes, with a lot of that time devoted to heavy-duty Q&A. With time for announcements and some pizza, it is not unusual for the entire meeting to last for two hours. 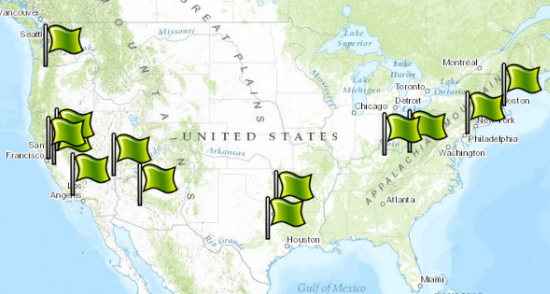 For several years I have wanted to drive across the United States, speaking at as many user groups as possible. After lots of planning, I am happy to kick off the first AWS User Group Road Trip. I’m planning to start in Boston on May 13th and end up back at home in Seattle almost three weeks later. With a little bit of R&R time along the way, I have time to speak at a dozen or so user groups. I’m going to be blogging, tweeting, and taking lots of pictures along the way. There will be a place for you to follow along as I make my way across the United States. If you run a user group in or fairly close to one of the cities below, your members would like to learn more about AWS and cloud computing, and you have some flexibility in your schedule, please email me (aws-road-trip@amazon.com) and we’ll get something set up. You may also want to think about combining forces with other local groups to make the event bigger and better. We’ll do our best to connect like-minded groups in each city as we hear from them. I’ll be in touch with each group to make sure that my materials meet the needs of the group. Monday, May 13 – Boston, MA – Boston AWS Meetup. Tuesday, May 14 – Philadelphia, PA – Philly Stop (Philly DevOps and PhillyAWS). Tuesday, May 28 – Santa Barbara, CA –Santa Barbara Cloud. Thursday, May 30 – San Francisco, CA – Boundary Headquarters (Lunch). As I said, I have wanted to do this trip for a long time and I’m already looking forward to making the trip and to meeting and speaking with as many AWS users as possible.